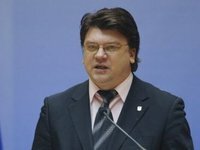 Ukraine's Minister of Youths and Sports Ihor Zhdanov has said the introduction of martial law in ten regions of Ukraine will not affect the holding of previously planned sports events. "The presidential decree does not cancel any sports tournaments of the national and international level, which are scheduled to be held in the Odesa, Mykolayiv, Kherson, Zaporizhia, Luhansk, Donetsk, Sumy, Kharkiv, Chernihiv, and Vinnytsia regions," the minister wrote on Facebook. He recalled that, just like before, the sports events may be suspended or canceled in case the organizers receive information on threats to people from the SBU State Security Service of Ukraine and other law-enforcement bodies. Zhdanov said the ministry continues to operate as usual.